Today Rebekah, one of our Customer Support Staff, is taking over our travel blog to share a few local tips about Ireland, her home country – and one of our most popular destinations! Welcome Rebekah. Ireland is without a doubt one of our customers’ favourite travel destinations. I’m not sure if it’s the green landscapes or the friendly Irish persona, but it certainly has found itself on many travel bucket lists. As an Irish native, I hope I can give you the advice you need on what to do see, do and eat on Ireland's west coast. You may be thinking, “Goodness, Ireland’s a small country: isn’t it all the same? And won’t we cover the whole country in a day and see everything we need?” The answer is NO. There are so many different places to travel and different things to see and do. Along the famous West Coast, the most common tourist destinations are Kerry, Cork, Galway, and Dingle. I’ll elaborate a bit on why you’ll want to visit these different spots, and how you can best spend your time. Don’t forget, ToursByLocals has an amazing range of tour guides that can bring you to all of the major destinations (and the tiny, out of the way places too!) You can find tours all over Ireland here. Kerry is absolutely breathtaking. The major highlights to see are the Ring of Kerry, including Torc Waterfall and Muckross House. Killarney and Dingle are also must-see towns full of Irish tradition, music and general craic (a word for fun that you will hear repeatedly on any visit to the Emerald Isle). If you are a seafood fanatic, Dingle is definitely the place for you to visit; restaurants such as Doyle’s restaurant and Out Of The Blue are 5-star restaurants popular for both locals and tourists. Dingle is also home to the famous dolphin Funghi, which even big children like myself like to go see every now and again. If you feel that all of this information is just too much to take in and you’ll never get to see it all, remember that a ToursByLocals guide is a great option. Our guides are locals who can help you to create a customized tour of all the things you would like to do. Our guide Annie runs a tour of the Ring of Kerryand Skellig Michael, and yes Skellig Michael is where part of Star Wars the last Jedi was filmed!! Cork, the Gaelic sports rival of Kerry, is another city with plenty of things to do. Our customers always try to fit in a visit to the Blarney Stone (smooching this stone apparently brings you good luck) and of course Blarney Castle. Within the city itself, there are plenty of bars and restaurants where Irish locals and tourists spend their evenings listening to traditional music and drinking pints. Try places like The Oliver Plunkett, The Franciscan Well Brewery and Sober Lane, which also has great Pizza! When visiting Ireland it is, of course, obligatory to try an Irish breakfast. Cork has loads of great places where you can feast on an Irish breakfast, whether it’s to help overcome too many pints from the night before, or just for pure enjoyment. Great places in Cork to get an Irish breakfast are Brick Lane and Bodega. Looking for a tour in Cork? Our guides can help. Galway is another Irish city with a great range of pubs and restaurants, serving Irish Breakfasts and great pints of Guinness! Pubs such as the Kings Head and The Quays are great fun, providing a local, traditional atmosphere and great food. Of course, there is far more to do in Galway than eat and drink pints, even walking down the main street in Galway is exciting and full of traditional singers and artists. Great tourist locations include Spanish Arch and the cathedral. A visit out to Salthill which is just a ten-minute walk is also a must! ToursByLocals has numerous guides in the area that can help you get the most out of your trip to Galway such as longtime local, Paul. Visiting Galway also means you are close to the Aran Islands. I recently visited the largest Island, Inis Mor, and had an amazing time cycling (slowly on my part) around the Island with my friends. Inis Mor is the perfect example of authentic old Ireland. The final location on my list is Donegal, recently noted as Lonely Planet’s new “Coolest place on earth.” (Yes, such a title exists!) I have to say I haven’t visited Donegal for years; its somewhere my parents would have brought us when we were young, but it hadn’t previously received much notice in terms of tourism. Well now it has! I had to outsource a bit of recent information on this one. 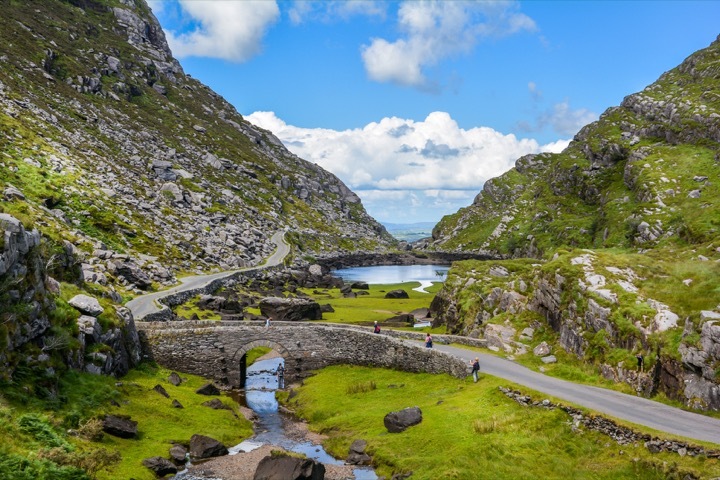 Donegal’s major tourist attractions are Glenveagh National Park and Slieve Leigh, one of the signature attractions on Ireland’s Wild Atlantic Way. Donegal is also known for its fishing villages and as a result amazing seafood restaurants such as the Seaview Tavern and Red Hugh’s restaurant. Donegal town is also a great place to visit; there are lots of things to see such as Donegal Castle, the Abbey of the Four Masters, and you can even take boat tours! ToursByLocals recently appointed their first Donegal tour guide, Connie who can bring you to all the best places throughout Donegal! So there you have it, my country. If it’s not on your bucket list, then it should be! There is so much to see and do and even eat, it’s a trip you won’t forget – I promise. And who doesn’t want to visit a country that’s so welcoming to all its visitors? As we say in Irish: Cead Mile Failte Romhat...A hundred thousand welcomes to you!